Subject: GET BACK TO ME IMMEDIATELY. I am very sorry to interrupt your peace since you are not expecting to receive any mail from me. However, I was obliged to do so due to the need and urgency of the message. I crave your indulgence and want to reassure you that I mean well to you and that it is only for our mutual benefit. So please do not be embarrassed. All of his Family lost there lives in the Disaster. Since then I have made several inquiries to his Country embassy to locate any of my client's extended Relatives, this has proved unsuccessful. After these several unsuccessful attempts, I decided to contact the Nigeria Chamber of Commerce where I got you contact. My client was a successful and accomplished family man, who works with Shell Company here in Africa, He was sent to Asia (Sri Lanka) for a Special Assignment for his Company (Shell) were he died. He left in his domiciliary account a 40% of individual private deposit with our Bank, which I have with me the Investment Deposit Certificate an important document worth twenty four Million United States Dollars (USD$24 Million). Until date I still manage this Deposit and will like to know you personally and then I will give every consent to the Bank here as knowing you and state in Court here declaring you as the next of kin to my late client. I am contacting you to assist in repatriating the money left behind by my late client. The Bank will pay this money to you as an inheritance. After the sudden death of my client, and for the reason that there as has not been a next of kin to my late client, the bank has decided to forfeit the money and declare it as an abandoned property as there is no next of kin who should inherit his funds. The board of directors of his bank adopted a resolution and I was mandated to provide his next of kin for the payment of this money within 28 working days or forfeit the money to the bank as an abandoned property. The bankers had planned to invoke the abandoned property decree of 1996 to confiscate the funds after the expiration of the period given to me. I have reasoned very professionally and I feel it will be legally proper to present you as the next of kin of my deceased client, so that you can be paid the funds left in his bank account. I therefore seek your consent to present you as the Next of Kin to my Deceased client so that the proceeds of this Bank Account valued at twenty four Million United Stats Dollars (US$24 M) can be paid to you. `The need for a foreigner as next of kin in this project is occasioned by the fact that the customer was a foreigner and a Nigerian will not perfectly fit in as his next of kin or heir. I have agreed that a reasonable percentage of the Fund would be giving to you as foreign partner; thereafter I will meet you in your country for disbursement. Please understand that my approach to you is based only on my positive reasoning and on the belief that you will not disappoint or betray me at last. The amount is fairly huge and we have agreed that on completion of the deal, you will be highly compensated for your assistance. An attorney will be contracted to help us revalidated and notarize all the necessary legal documents that can be used to back up any claim you may make as soon as I hear from you with your full consent to present you to the Bank as the next of kin to my late client and after both of us reach an agreement. You are therefore expected and advised to display high degree of maturity, responsibility and understanding in handling this information. I will give you all the details in my next mail when you have indicated your interest and commitment to work with me. Always remember that this is the highest confidence and trust any person can repose on the other, especially when it is considered that we did not know ourselves before. I hope you will honor me too. I will come over to join you in your Country for disbursement when the funds hit your account. More so for an effective and easy communication I will advice that you furnish me with your telephone and fax number. Subject: Re: GET BACK TO ME IMMEDIATELY. Oh my goodness! What could I possibly do to help? Thanks so much for your urgent response. What i want you to do now is that you contact a lawyer to seek for assistance and to be your attorney. 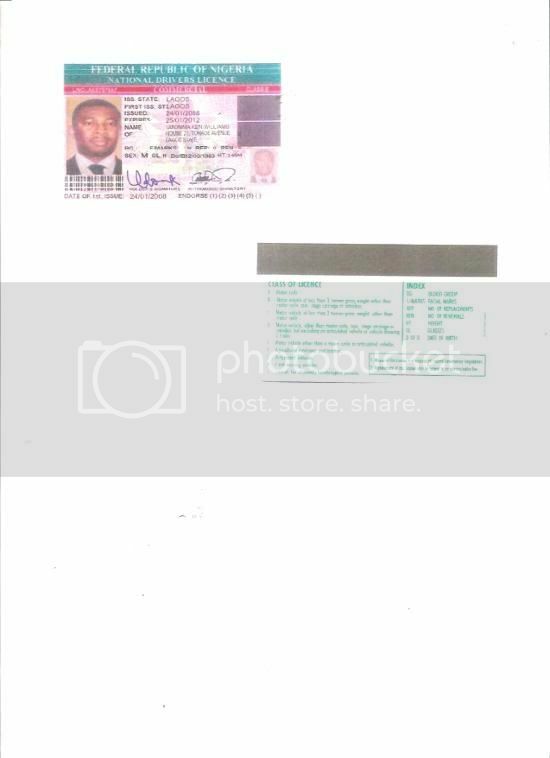 Infact, attached here is a copy of my Driver's License for your sighting as much as i will want you to send me a copy of yours because i should be worried about your identity more than you considering the amount i want to entrust in your hand.So, i would have done that since but my Scanner has fault and i have just rectified it now. Please do not be afraid because the lawyer whom your will contact as your attorney / representative here will advice you on what to do but i assure you that their will be no problem on this business because i am in control of the Account here. so, you are 100% safe and again, i have spoken with a highly experience and notable lawyer who has his chambers in (Accra Ghana) and Nigeria on phone about you, that you are the next of kin to late Mr. E. Wayne who is your relation and until his death remain one of our customer that deposited some fund here in the bank and that you want to engage him as your attorney representing you here to handle the processing and the release of your inherited fund of $24million USDollars which you will provide a bank account for the transfer of the fund. 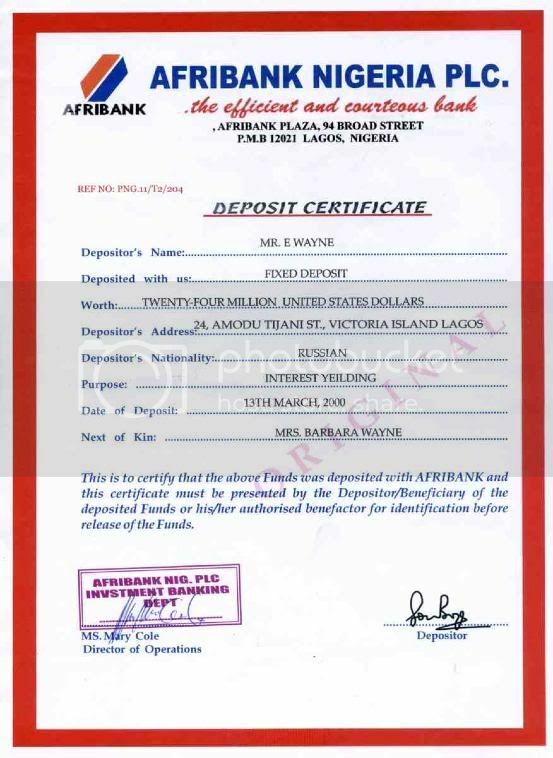 The attached deposite certificate and death certificate as an evidence and also a bank account where they will wire the fund into that your nominated bank account in your country were you resid presently to enable you claim the fund. He has axcepted to assist you though he told me on phone that until he hear from you, he will be ready to help as long as both of you negotiate the procedures and what it will cost to procure the necessary papers in your faviour ( name ) at the court to back up your claim. I assure you the lawyer is a honest person and well known all over Africa for handling issues like ours and he is very reserve man with principle. He is a man of his word and my advice for you is that you should work with him directly by following his instructions strictly without any delay, anything he demand for the smooth procurement of the papers, make sure you give it to him immediately as every expenses you made in the cause of this transaction will be refunded to you as soon as the fund inter into your account on my arrival in your country before sharing. I will do my best in the bank to make sure that the fund is release as planned. We will smile at the end of the transaction because what we stand to benefit in this transaction will be great and it is something to testify about after the whole thing is carried out safely which i am sure their will be no problem because i have already perfected everything before now in my office and am still working on it now. Please contact him immediately for the assignment and Bellow is the contact information's of the lawyer; BARRISTER Coker Ayew. Thanks so much for your understanding and co-operations. I am emailing you because my new friend Mr. Ken Williams referred you as the person to converse with about the $24 million dollars a Mr. E. Wayne left behind, since I have learned that I am the next of his kin. If you could get back to me on this matter as soon as possible, it would be greatly appreciated. Thank you! Thank you for letting me know that Mr. E. Wayne has left me this amount of money. I never knew him personally, but I believe he was a good man. As you have requested, I have contacted Mr. Coker Ayew about the funds and am awaiting his response. I must thank you for the kindness you have shown me by telling me about these funds. Hope to speak again soon. Now I wait to see how this will progress. 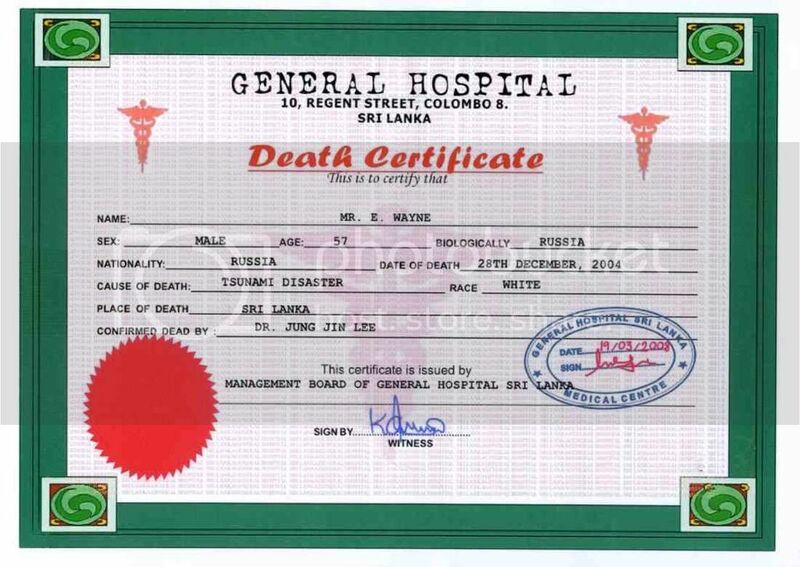 recently got a death certificate that had the entry "BILOGICALLY: Christian". Unfortunately, my lad seems to have caught on. So my first bait ends in failure.